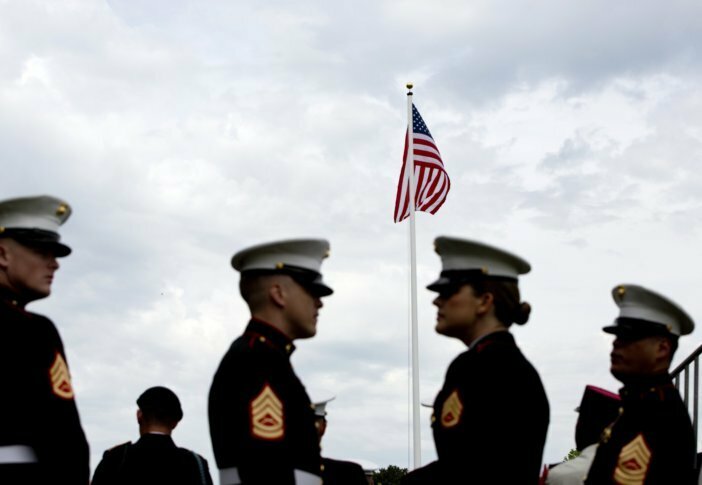 High-ranking military officials from the U.S., France and Germany have taken part in Memorial Day ceremonies at an American cemetery in Northern France to mark the battle of Belleau Wood, a turning point in World War I and a major event for the U.S. Marine Corps. BELLEAU, France (AP) — High-ranking military officials from the United States, France and Germany took part in Memorial Day ceremonies at an American cemetery in France on Sunday to mark the centennial of the battle of Belleau Wood, a turning point in World War I and a key moment in U.S. Marine Corps history. The ceremony at the Aisne-Marne American Cemetery in the village of Belleau featured speeches Marine Corps Commandant Gen. Robert Neller and other military officials, prayers, wreath laying, poem readings, and the national anthems of the three countries. More than 5,000 people attended the event to commemorate the fierce, monthlong battle, which is considered the first major engagement of U.S. troops in the war. Belleau Wood, where Marines helped Allied Forces secure victory, also helped to establish the prestige and reputation for bravery of the Marine Corps overseas. Rear Admiral Brent Scott, chaplain of the U.S. Marine Corps, said the battle was a “critical turning point” for the Corps. “There are many great stories that have come out of this battle, that have inspired Marines for generations,” Scott told The Associated Press. Most of the 2,289 American soldiers, including 474 Marines, buried in the Belleau cemetery died in the French northern Aisne-Marne region in 1918. More than a thousand other servicemen are memorialized and honored by name on Walls of the Missing. The June 1918 battle in and outside the Belleau Wood and the decisive engagement of the U.S. forces became a defining moment in WWI by containing a break by German troops through the Western Front and foiling their push toward Paris. After the hostilities of World War I ended with the Armistice on Nov 11, 1918, many American families faced the decision of whether to bring their dead home or to have them buried where they fell. Despite the distance and the decades that have passed, the service members still are honored each year for Memorial Day. But the task of remembering them has fallen after 100 years to grandchildren or distant relatives who sometimes travel from far away to pay their respects. Mark Shively and his wife, Linda, from Beaverton Oregon, also had a personal, if less direct, reason to be at the Aisne-Marne American Cemetery this weekend. They crossed the United States and the Atlantic Ocean to spend Memorial Day with the officer who left a lasting impression on Shively’s grandfather. Shively’s grandfather, Marine Corps Pvt. Norman Alfred Roberts, fought in the battle of Belleau Wood in June 1918. He was gassed and wounded on June 12, according to a small pocket diary he kept and that his descendants keep as a memento. After recovering and being wounded a second time, Roberts was sent home after the Armistice. His unit commander, Marine Corps Lt. Carleton Burr, a 1913 Harvard graduate from Milton, Massachusetts, would not be as lucky. While Burr survived the carnage while fighting alongside Roberts at Belleau Wood, he was killed in action in July 1918. At the Aisne-Marne cemetery, Lt. Burr lies in plot A, row 2, grave 76. “My grandfather admired him very much. If it hadn’t been for his leadership, my grandfather might not have made it,” Shively told The Associated Press. Philippe Sotto reported from Paris. Nadine Achoui-Lesage in Belleau contributed to the report.